communication or by acquaintances. Seven works/ abstracts (46.67%) were retrieved out of 15. Key words: Diabetic neuropathy, Ayurveda, Systematic review, PG and Ph.D.Thesis. Y. NIRANJAN, M.S. BAGHEL. AN OVERVIEW OF POSTGRADUATE AND DOCTORAL LEVEL RESEARCH CONDUCTED IN AYURVEDA EDUCATION INSTITUTIONS DIABETIC NEUROPATHY. J Res Educ Indian Med . 2012; 18(3-4): 131-142. Y. NIRANJAN, M.S. BAGHEL. AN OVERVIEW OF POSTGRADUATE AND DOCTORAL LEVEL RESEARCH CONDUCTED IN AYURVEDA EDUCATION INSTITUTIONS DIABETIC NEUROPATHY. http://www.jreim-ayushjournal.com/?mno=192039 [Access: April 25, 2019]. Y. NIRANJAN, M.S. BAGHEL. AN OVERVIEW OF POSTGRADUATE AND DOCTORAL LEVEL RESEARCH CONDUCTED IN AYURVEDA EDUCATION INSTITUTIONS DIABETIC NEUROPATHY. J Res Educ Indian Med . (2012), [cited April 25, 2019]; 18(3-4): 131-142. Y. NIRANJAN, M.S. BAGHEL (2012) AN OVERVIEW OF POSTGRADUATE AND DOCTORAL LEVEL RESEARCH CONDUCTED IN AYURVEDA EDUCATION INSTITUTIONS DIABETIC NEUROPATHY. J Res Educ Indian Med , 18 (3-4), 131-142. Y. NIRANJAN, M.S. BAGHEL. 2012. AN OVERVIEW OF POSTGRADUATE AND DOCTORAL LEVEL RESEARCH CONDUCTED IN AYURVEDA EDUCATION INSTITUTIONS DIABETIC NEUROPATHY. Journal of Research and Education in Indian Medicine (Est.1982), 18 (3-4), 131-142. Y. NIRANJAN, M.S. BAGHEL. "AN OVERVIEW OF POSTGRADUATE AND DOCTORAL LEVEL RESEARCH CONDUCTED IN AYURVEDA EDUCATION INSTITUTIONS DIABETIC NEUROPATHY." Journal of Research and Education in Indian Medicine (Est.1982) 18 (2012), 131-142. Y. NIRANJAN, M.S. BAGHEL. "AN OVERVIEW OF POSTGRADUATE AND DOCTORAL LEVEL RESEARCH CONDUCTED IN AYURVEDA EDUCATION INSTITUTIONS DIABETIC NEUROPATHY." 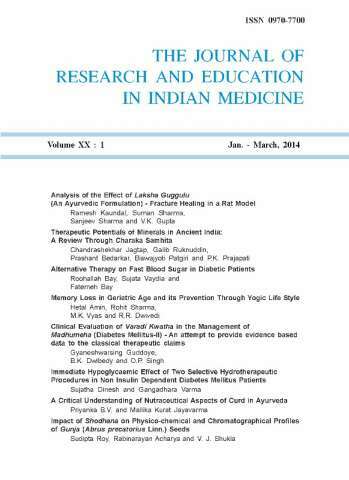 Journal of Research and Education in Indian Medicine (Est.1982) 18.3-4 (2012), 131-142. Print. Y. NIRANJAN, M.S. BAGHEL (2012) AN OVERVIEW OF POSTGRADUATE AND DOCTORAL LEVEL RESEARCH CONDUCTED IN AYURVEDA EDUCATION INSTITUTIONS DIABETIC NEUROPATHY. Journal of Research and Education in Indian Medicine (Est.1982), 18 (3-4), 131-142.